There are many organizations working to raise funds for Puerto Rico and Friedman Justice League has chosen to pool our efforts to Support “Regrow Puerto Rico”. Please consider donating at the link above and encourage your network to spread the word. We would like to extend a hearty thanks for giving of your time and reflection to the Puerto Rico Lunch n’Learn last week. It was clearly of great interest to the minds and concerned hearts on campus, and we’re grateful for what all of you brought to the conversation. The Friedman Justice League (FJL) invites you to an awareness campaign of activities and events to explore farmworker and labor justice. We are excited to host and partner with the Coalition of Immokalee Workers (CIW) during the campaign. All are welcome and encouraged to participate and contribute as much as possible. We hope to see you! The installation will be a visual representation of nutritional and social impacts of, “What’s in your food?” It will be posted throughout the Friedman School public spaces to inspire reflection and dialogue throughout the campaign. Created by FJL members, Alejandra Cabrera and Julie Kurtz. The poster-making session will prepare signs, chants, and testimonials for the Wendy’s Boycott on Saturday. This is a great way to engage creatively and express your support for farmworker and labor justice. Please bring cardboard, poster board, markers, paints, etc! Program, which verifies humane working conditions and fair wages for workers across the supply chain. You can support by attending, helping the poster-making session, and spreading the word! engage in an intimate, small-group setting. JOIN The Friedman Justice League and Tufts Institute for the Environment for a movie screening with discussion to follow. There will be food! As a part of Digging Deep week in February, the Friedman Justice League led a week of storytelling, discussion, and reflection on issues of food justice in the world, country, and Friedman campus. FJL organized a weeklong interactive bulletin for Friedman students to contribute experiences and reflections on their experiences with food, called “Digging Deeper: Foodways.” It prompted students each day with a new theme. The themes and reflections are recorded anonymously below, as compiled by Sarah Chang and Kirsten Archer. 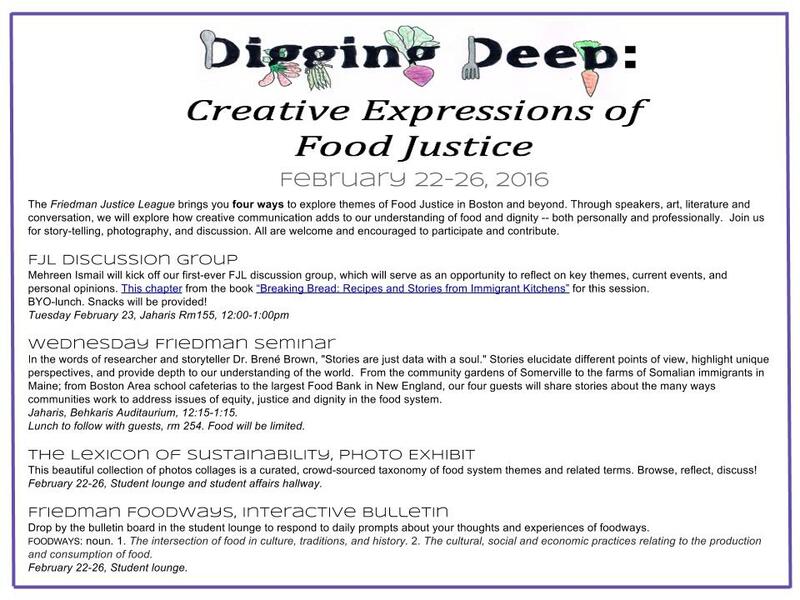 The Friedman Justice League is pleased to announce Digging Deep: Creative Expressions of Food Justice. The week will include a discussion group, a Seminar, a Photo Collage Exhibit, and an interactive bulletin in the student lounge. Join us February 22-26. We hope to promote an engaging and transformative dialogue. Join us for a screening of Black Gold! The Friedman Justice League has teamed up with the Fletcher Food Policy Club to bring a screening of Black Gold to Tufts University. Black Gold chronicles inequities for coffee farmers in Ethiopia, highlighting shortfalls in global supply chains to support farmers, and emphasizing opportunities for corporate and consumer responsibility. Join us at 6 for refreshments; the screening will begin at 6:30pm. A panel will follow the film, including experts from the Friedman School and Counter Culture Coffee to follow. Admission is free. The event will take place at the Tufts University Fletcher School of Law and Diplomacy, ASEAN Auditorium. 160 Packard Ave, Medford, MA. Please see the attached flyer for additional information – we hope to see you there!